What is AVCHD and AVCHD Lite? Developed by Panasonic and Sony, AVCHD was first introduced in 2006. Although intended for consumer camcorders, it was later used by professional movie makers. AVCHD uses the MPEG-4 AVC/H.264 standard, supporting a variety of standard, high definition, and stereoscopic (3D) video resolutions. For audio compression, it supports bothDolby AC-3 (Dolby Digital) and uncompressed linear PCM audio. Stereo and multichannel surround (5.1) are both supported. AVCHD Lite, produced by Panasonic, is a subset of AVCHD defined as devices using the codec at video resolutions up to 1280x720p. Generally this means any camera that uses AVCHD and records 1280×720 video will be referred to as an AVCHD Lite camera because it’s unlikely that cameras will record AVCHD video at lower resolutions. UFUSoft AVCHD Converter for Mac is also a Mac AVCHD/AVCHD Lite Converter for Canon, Sony, Panasonic and JVC cameras. It’s specific on converting AVCHD/MTS/M2TS, AVCHD Lite MTS files to various video formats in sync and encoding them with preferred video codec for NLE programs on Mac, such as Final Cut Pro, iMovie, Final Cut Express, Avid Media Composer, Adobe Premiere Pro, Apple Aperture 3, Kdenlive, Keynote, Avid Xpress Pro, Adobe Creative Suite 6, Adobe After Effects CS6/CC7, DaVinci Resolve, iPhoto. And support ProRes, DNxHD, DVCPRO, Apple InterMediate codec, QuickTime MOV outputting with the best video quality interlaced or progressive. It’s also a smart assistant to well sync your footage to portable devices for playing back on iPad/iPhone/iPod, Android Devices like Samsung Galaxy, Nexus 7, Kindle Fire HD; well support Nokia Lumia, Apple TV and other HDTV videos outputting; and other devices like XBox 720, ps4, etc. UFUSoft AVCHD Video Converter a smart AVCHD/AVCHD Lite Converter that is designed for transcoding your 2D/3D MTS/M2TS/M2T/MOD/TOD/TS files. With it, you can easily convert to AVI/WMV/MP4 for playback on pc with least quality loss; different camera brands such as Sony, Canon, Panasonic and JVC are all well supported. Also, the AVCHD MTS/M2TS Converter is able to output well compatible videos for iDevices, Android and Windows tablet/phone, including iPad/iPhone, Google Nexus 7, Kindle Fire HD, Samsung Galaxy Tab 3/Galaxy S4, Surface Pro and so on. Moreover, other formats for mainstream editing program are also well supported, such as Avid Media Composer, Avid Xpress Pro, Adobe Premiere Pro, Adobe After Effects, Adobe Creative Suite 6, Cyberlink PowerDirector, DaVinci Resolve, Magix Movie Edit Pro, Kdenlive, Keynote, Sony Vegas, Windows Movie Maker, etc. 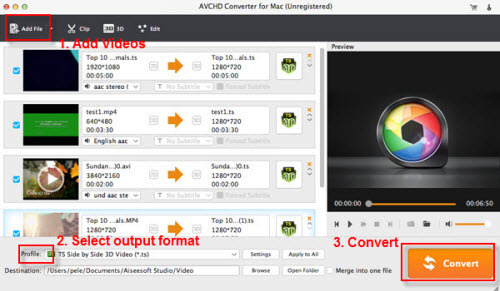 Step 1: Run the best AVCHD Video Converter (for Mac), add AVCHD/AVCHD Lite (*.mts, *.m2ts) video files into this program. Step 2: Click “Format” bar to choose output video format from the powerful AVCHD/AVCHD Lite Video Converter. Step 4: You can trim, crop the AVCHD/AVCHD Lite video via the best AVCHD MTS/M2TS Video Converter. Step 5: Click convert button to convert AVCHD/AVCHD Lite (*.mts, *.m2ts) video files on Windows or Mac. Step 6: When the AVCHD/AVCHD Lite video conversion is done, you can click “Open” button to get the converted video files.